We chose a 4×4 Sprinter as the base van for our conversion. There are several other popular vehicles but the Sprinter best met our needs. The 4×4 Sprinter was first offered in the USA in 2014 (2015 model year). We put our names down for one on the first day ordering opened. It’s a factory 4×4 option, but it actually uses a transfer case built by Oberainger, who also offer aftermarket conversions. The 4×4 has been offered in Europe and Australia for many years. The 4×4 isn’t a typical American system. It’s not all wheel drive, where the vehicle always gives power to all four wheels. It’s not got on-the-fly engagement either. You have to stop the vehicle before you engage or disengage four wheel drive. It also doesn’t come with locking differentials, which seems to upset some of the real off-road crowd. Instead, it uses the vehicle’s brakes to stop wheels from spinning when they don’t have traction. That’s good enough for us and the places we’ll use it. Sprinters are a weird mix. They are designed to be work vans but they are manufactured by a luxury car company. They don’t have wood grain or leather interiors, but you can get a (crappy and worthless) GPS enabled bluetooth stereo system that may have seemed premium about 5 years ago. You can’t get comfortable seats, but you can specify alloy wheels. Some of the options just don’t make much sense. The vans have spartan interiors, but have options for multiple consumer-style safety features like blind spot assist, backup cameras, lane keep assist, adaptive headlights, and so on. Interestingly, those safety features are probably more important on a van than they are on the average Mercedes SUV being driven around a suburban neighborhood. The van has big potential blind spots and it’s long – especially the 170″ wheelbase model. We ordered a safety package on our van, but we can’t report on how well it functions because the dealer we ordered from sold our vehicle out from under us and the replacement doesn’t have those features. So what options should you get? We made a list of all the options you might want on a conversion van, but here’s a summary. All told, the safety features (option JP2 driving assistance or option CO3 active safety plus) are probably the most attractive additions. There’s no way you could retrofit any of this stuff. The cheap, strong, factory tow hitch (option X22) is no more expensive than an aftermarket unit, and the wiring is done by Mercedes rather than some local grease monkey. That’s important because the van gets upset if it senses the wrong current draw on any of the lighting circuits. The factory install also gives you an electronic brake hook-up. The Bi-Xenon headlights (option X13) are very much brighter and nicer to use than the regular ones. You used to be able to order suspension seats (X01) or swivel seats (F01). Those options are on hold while Mercedes works out how to deal with in-seat airbags in combination with a moving seat base. Again, we ordered suspension seats but never got to enjoy them. The comfort seat upgrade over the basic seats isn’t comfortable. The seat has slightly more adjustability but is still pretty much a base model truck seat. Heated seats (H15, H16) are not standard, so you’ll probably want that option too. Make sure you get electric mirrors in one of your options packages. Otherwise adjusting them means multiple trips around the van. Ditto the multi-function steering wheel. This option is less about the steering wheel and more about the upgraded dash display you get with it. The buttons WILL work with aftermarket stereos if you buy the right adapter. Also, order option FZ9 – two extra keys. The option costs some ridiculously small sum of money. Replacing the keys when you lose one costs an exorbitant amount. Your choice. In our opinion, there are some other options you can either take or leave. The two-stage sliding door opening is a nice option, because it catches the door half way along the track so you can retain more privacy or let less heat out during the winter. But there’s a cheap and sturdy aftermarket fix that seems to work really well and doesn’t leave a chunk of ugly mechanism above the inside of the door opening. Cruise control (MS1) is a questionable addition. Sure, it’s nice when you’re on the freeway for long stretches, but the stalk is easy to knock when you reach for the turn signals, and regardless of which way you tap it, it immediately tries to take you back to your last speed. Scenario: You’ve been cruising at 70 on the freeway. You turn off into Small Town USA and crawl down the main drag at 25 MPH. You signal to turn into a food place, only instead the van tries to aggressively speed back up to 70. Not good. We cut ours down to stop that happening, and we’ve been happy with it since then. The rear view camera that comes stock on the van is very useful for backing up, but it doesn’t replace a rear view mirror. It doesn’t show enough distance behind you for that. Mercedes offers several diesel heater options for the van. Consensus seems to be to avoid them all, and install a similar unit from Eberspacher yourself later. Mercedes hobble the heaters and add a layer of electronic complexity that isn’t needed. There are a few engine/transmission options too. The 4×4 only comes with the 6 cylinder 5-speed drivetrain option. If you’re happy with rear wheel drive, there’s also a 4 cylinder dual turbo 7-speed option which is much loved by those who drive it, and is about 5 MPG more efficient. You also have to choose between the 2500 (single rear wheels) and 3500 (dual rear wheels, higher load capacity). We have the 2500 and it suits our needs. Commercial RV conversions use the 3500 because they fit a whole bunch of heavy useless stuff in. If you are doing a full-on conversion or want to carry heavy things inside (motorbikes, for instance) then you might want the extra payload of the 3500. You can decide which is more likely to work for you. Ford have stopped making their Econoline van, which is the archetypal “Sportsmobile” adventure van, with a 4×4 conversion by Quigley, a pop-top, and big knobby tires installed. They replaced the Econoline with their full-size Transit van – a vehicle that the rest of the world has had in various incarnations since the 1960s. The new Transit is slightly more fuel-efficient than the Econoline but still doesn’t come with four wheel drive from the factory in the USA. Ford will ship it straight to Quigley for you for the conversion to take place. Plus points are price – its base price is cheaper than a Sprinter (until you start adding in the options to make a comparable build) and its walls are squarer, which makes it easier to convert. It’s also available in a gasoline engine version. In fact, the diesel version costs $4k more. Maintenance is likely to be cheaper with better parts availability, just so long as the majority of Ford locations start offering service for the Transit. From 2004 until 2010, Dodge sold the Sprinter in North America. Mercedes took the Sprinter brand back in 2010. 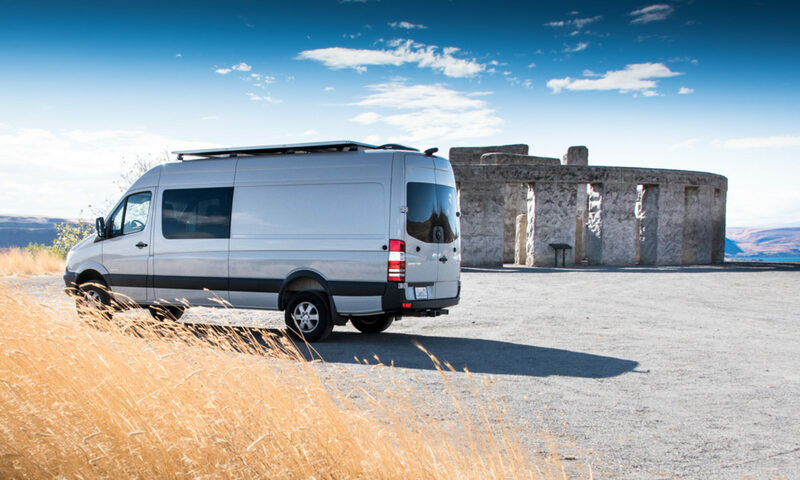 Dodge have since replaced that hole in their line-up with the Fiat Ducato, branded as the RAM Promaster in the USA. It’s a front wheel drive van, so the floor in the rear is much lower – less step up, but also slightly less ground clearance. The base models are cheaper and there are gasoline engine versions. No 4×4 option is offered. Front wheel drive should provide better traction, but the lower ground clearance could cause issues on real off-road trails. With more of a “snout” than the other choices, the Nissan NV looks like an oversized pickup truck with a panel van back end. The NV also has less room inside than the other options, but it could be the right choice for someone who doesn’t need so much interior space. Again, no factory 4×4 but Quigley will convert one for you. Once you’ve chosen the vehicle you want to convert, check out our information on all the steps you’ll need to follow to get from the planning and dreaming stage to having a fully converted van.